Juan Fernando Rodriguez Tellez came to Capitol Hill to persuade EPA regulators to protect farmworkers from pesticides. This is his story. At first, the sticky drops raining down were a welcome reprieve from a long, hot day spent uprooting weeds on a Minnesota farm. “I remember thinking, ‘This is cool!’ As in, ‘This will cool me off,’” said Juan Fernando Rodriguez Tellez. As Tellez and his friends continued to pull at the huge weeds tangled within the cornstalks, they paid little attention to the crop duster flying overhead that was supposed to be dousing a neighboring field. Tellez wore long sleeves and pants for protection against the sun, but as he pulled weeds the drizzle leaked inside the glove on his right hand. Over the next month, the fingers on Tellez’s exposed hand went numb. It was only later that he learned those drizzles were a pesticide meant to kill insects. Three years later, as the 17-year-old Tellez recounted this traumatic scene for EPA Administrator Gina McCarthy and several senior members of her staff, the packed room stood in complete silence. McCarthy, in particular, was visibly moved. She thanked Tellez for his story, adding that she has a son his age. Tellez’s story of pesticide exposure is all too common, unfortunately. Agricultural workers report up to 20,000 pesticide poisonings every year. 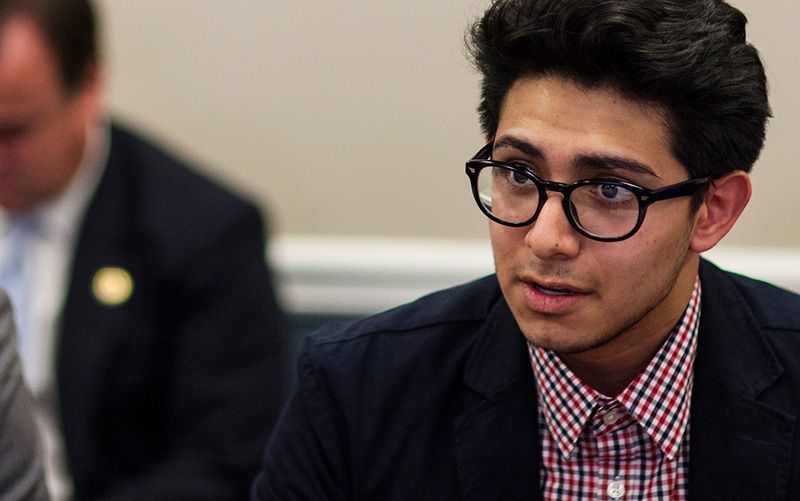 It is uncommon, however, for an underage farmworker to meet with the elite power structure of the EPA. It is even more uncommon for the EPA to listen. Last summer, Tellez had traveled from his home state of Minnesota to Capitol Hill for one purpose: to convince government regulators and congressional representatives to strengthen the Agricultural Worker Protection Standard. Adopted in 1992, the Worker Protection Standard is the only federal standard intended to protect the 2.5 million agricultural workers in the U.S. from pesticide exposure and poisonings. The standard is notoriously weak and difficult to enforce, providing fewer workplace protections against pesticide exposures for farmworkers than for workers using hazardous chemicals in non-agricultural sectors. Juan Fernando Rodriguez Tellez, center, meets with farmworker activists to prepare for EPA decision-maker meetings. Tellez wasn’t alone in his actions. Together, he and more than 20 other farmworkers and advocates from across the country filled stately meeting rooms usually occupied by high-paid industry lobbyists from K Street. 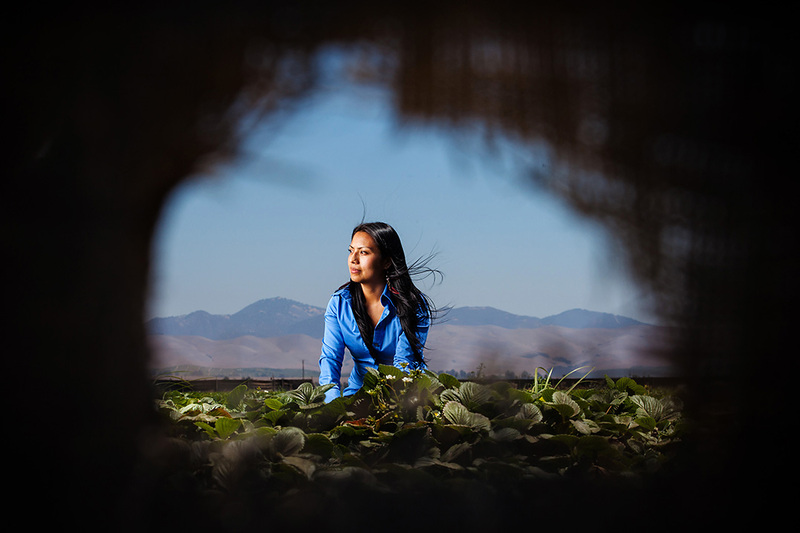 They brought stories from the front lines of farming communities: stories like Tellez’s of how airborne pesticides often land on workers who then take the chemicals on their clothes home to their families. They also told regulators of vomiting or feeling faint in the fields after being sprayed with pesticides and not saying anything for fear of losing their jobs. Tellez, looking and acting well beyond his years, was one of several young farmworkers who strongly support minimum age requirements for handling pesticides. Because they are still developing, children are more susceptible to the toxic effects of pesticides than are adults. He adds that many farmworkers have no knowledge of the health effects of pesticide exposure, and that these pesticides can have lifelong health effects—not only for the workers in the fields but their families too. “The paycheck just isn’t worth a lifetime of suffering,” he says. 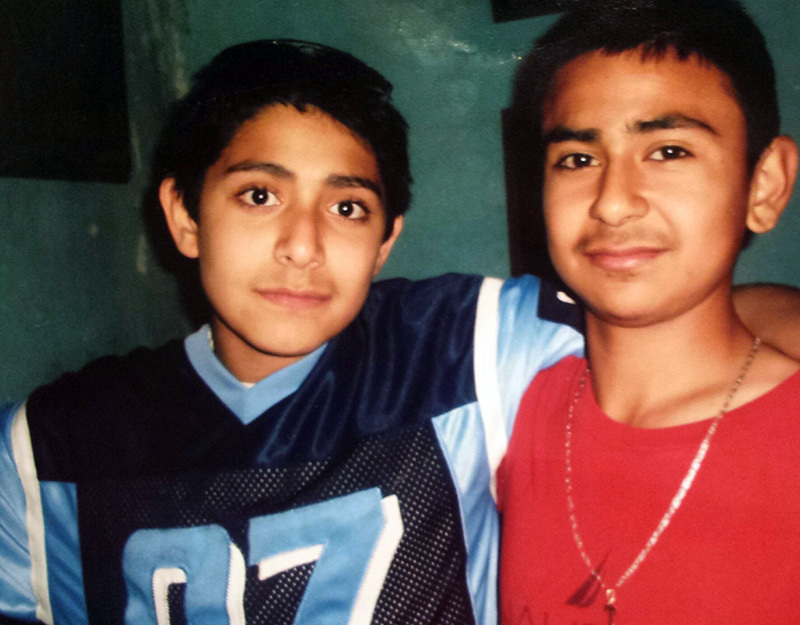 A 12-year-old Tellez (left) and his cousin, a year after he began working in the fields. Tellez began working in agriculture by clearing rocks out of soybean fields, working 10 to 12 hours a day during the summers. In 2010, after years of witnessing his family and friends work under hazardous conditions in the fields, he began working with Centro Campesino to improve the lives of members of the Latino and migrant community in southern Minnesota through community organizing, education and advocacy. He says he wants to create change, just like his mother did through her volunteer work as he was growing up. Despite the risk to farmworkers, the EPA had stalled on enacting stronger protections for farmworkers for nearly two decades. In 2011, Earthjustice filed a legal petition to force the EPA to update the standard, followed by policy meetings with EPA officials. In early 2014, the EPA finally proposed updates to the standard. During the public comment period that followed, more than 200,000 people across the country—including nearly 90,000 Earthjustice members and supporters—stood with farmworkers and called for the proposed standard to be strengthened. But in order to ensure that the new standards weren’t watered down or scrapped altogether, the farmworker coalition needed to do more. After all, the agricultural industry is notoriously powerful on the Hill, and it wasn’t giving up without a fight. While Big Ag used its seemingly unlimited funds and accessibility to push its agenda on Capitol Hill, Earthjustice, in partnership with a diverse coalition, sought to level the playing field by flying in members of farmworker communities impacted by pesticide exposure. “These are people who are literally getting sprayed with chemicals while picking crops,” says Andrea Delgado, a senior legislative representative at Earthjustice. 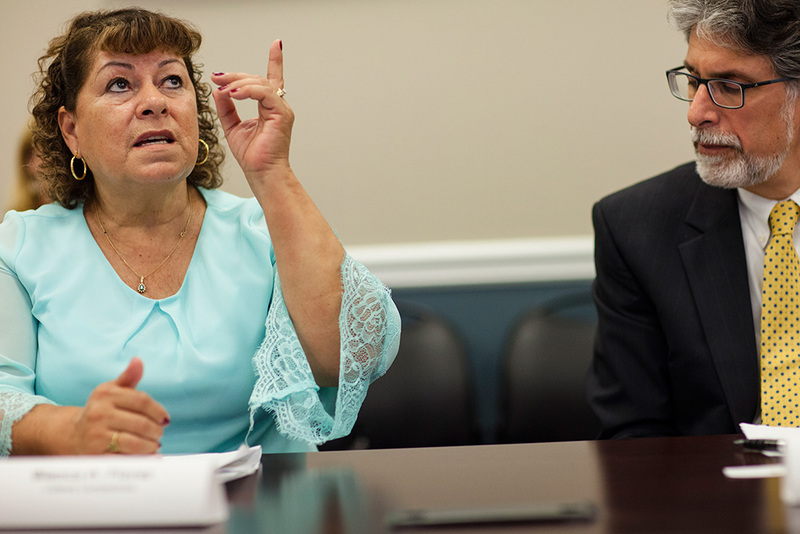 Delgado, speaking during a meeting with Tellez and other farmworkers in Washington, D.C.
At the end of September 2015, the EPA announced updates to the Worker Protection Standard that substantially increase protections for farmworkers. The new rules establish a minimum age of 18 for pesticide handlers, increase frequency of mandatory worker safety training from once every five years to once every year, and improve the content and quality of worker safety trainings. The new standard also provides updated rules on personal protective equipment and ensures that information that workers receive about the pesticides is more readily available and accessible in various languages. 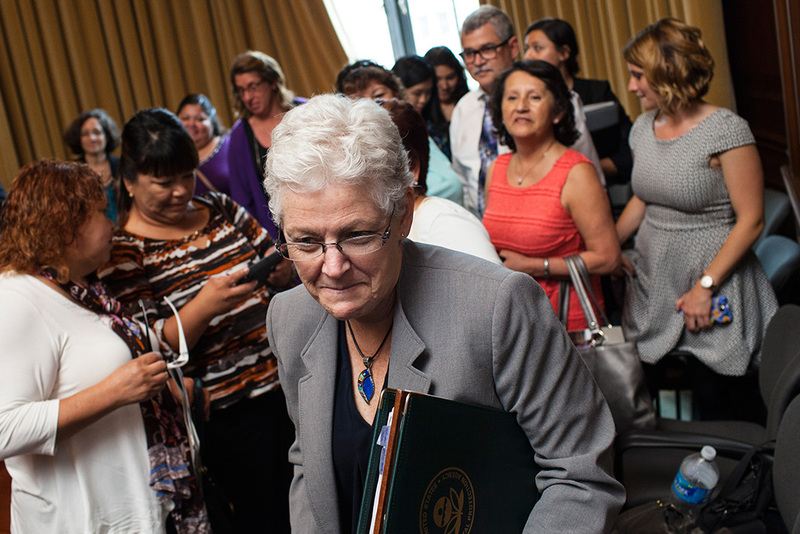 EPA Administrator McCarthy, foreground, exits a meeting in June, 2015, after listening to farmworkers' personal testimonies in support of a strengthened Worker Protection Standard. And the fight continues, says Tellez. Although the Worker Protection Standard is a federal regulation, it is implemented and enforced by the states. In most states, the agricultural department is responsible for protecting farmworkers from pesticide exposure and ensuring that the federal rules are in place. But even in states such as California, where state laws are often more protective than federal laws, workers are commonly exposed to pesticides because of the lack of oversight by state officials. 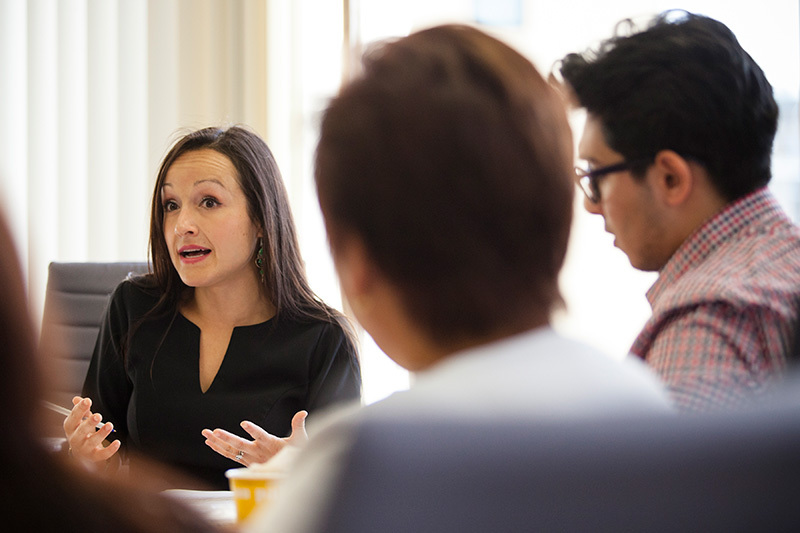 Community and nonprofit groups are often the only source of education, medical and legal help. Earthjustice will continue to work with farmworker advocates to ensure that the new standards result in meaningful change on the ground, as well as continue to target the most hazardous pesticides used in the field. Earthjustice was honored to partner with dozens of groups to help convince the EPA to strengthen the Worker Protection Standard, including, Alianza Nacional De Campesinas, California Rural Legal Assistance Foundation, Campesinos Sin Fronteras, Centro Campesino, Comite De Apoyo A Los Trabajadores Agrícolas, Farm Labor Organizing Committee, Farmworker Association Of Florida, Farmworker Justice, GreenLatinos, Labor Council For Latin American Advancement, Lideres Campesinas, Migrant Clinician’s Network, Northwest Treeplanters, Pesticide Action Network, United Farm Workers, Worker Justice Center Of New York. A version of this story was published in the Earthjustice Quarterly Magazine, Winter 2015 issue. Our communities are exposed to pollution and chemicals coming from many directions—coal plants, highways, truck routes, hazardous waste sites, and more. Yet, EPA does not assess the full impact of pollution from multiple sources.